June 1, 2006 we arrived in Portland, Oregon and were whisked across the border to Vancouver, Washington where we were to attend an important birthday bash of one of our closest friends. I’ve been instructed not to mention the actual age of this close friend so we will leave it at that. As there was to be a day between our arrival and the grand event Els and Eleanor suggested we spend that day on tour, and were there bright and early next morning to lead us gently to the minivan as we fought jet lag and tried to appear awake and personable for the journey. Naturally we were curious as to what we would be seeing that day. Both Els and Eleanor were uncharacteristically silent on this issue and we did not have the energy to pursue the matter. It was only when we noted the road sign that said “Mt St Helens” our adrenalin kicked in and we were suddenly wide awake. In 1980 we purchased a hatchback In Massachusetts and embarked on a two month tour around the USA. We covered 34 states and saw all the touristy things with the added bonus of a tornado in Kalamazoo, being snowed in at Yellowstone Park, enjoying an earthquake in Bakersfield and of current interest the 1980 eruption of Mt St Helens. We had stopped over with our friends Vi and Ralph at that time and they urged us to do two things. 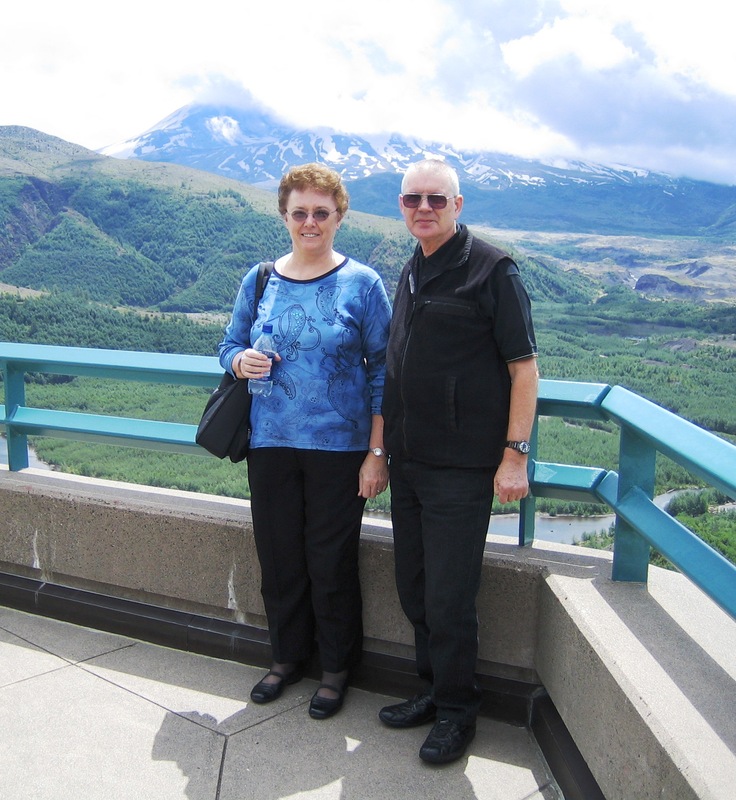 Firstly visit Mt St Helens, and secondly stay an extra day with them. We stayed the extra day with Vi and Ralph, and that’s when the mountain blew. What would have happened if we’d proceeded to the mountain the day before, as originally planned? Our next stop on that occasion was to be Walla Walla, Washington, home of the Walla Walla sweet onion, and I can remember having to go due south and circle around to that rural and educational community to avoid the thickest ash fall. Ash was falling like snow and it cost us a small fortune to clean the engine and its appendages after emerging from that ash. We were still washing ash sediment out of the bodywork a month later when we sold the car in Washington DC. That experience had given us a continuing interest in Mt St Helens, and we noted news bulletins indicating the mountain was currently giving a grumble or two. Now we were heading for Mt St Helens! Els gave a benign smile as he saw me reading the sign and assured me he had not wanted to frighten us by telling us where we were headed that day. Oh thanks! Well the fact that I am writing this shows the mountain behaved like a lady that day, and after 26 years we finally made it to the mountain. The Tourist Facility there has a lot of very interesting information on the volcano, and some spectacular movies of the actual eruption that killed many people and animals, and devastated the countryside for an incredible distance. Visit Mt St Helens, it‘s worth the trip. Consult your family volcanologist before going just to be sure the mountain will receive you as graciously as it did us in June 2006. Well, it has been only 20+ years, now, since old St. Helen’s “popped her cork” and by geologic time that is less than a blink. She will probably lay dormant for a long time to come. Buuuttt! Things seem to be much different in just recent years by man’s calendar that I have grown to expect anything from mother nature. She is very angry with us members of the Human race right at this moment. We have played around in her domain with reckless abandon and we need to be taught a lesson. Maybe the Mayan milleniam message is just the thing. mankind will be changed as we know it – was the translated message as I heard/read it. It may just come about?!? Yes it is an interesting place to visit and we are glad we went. They have an excellent information centre there and a good restaurant.